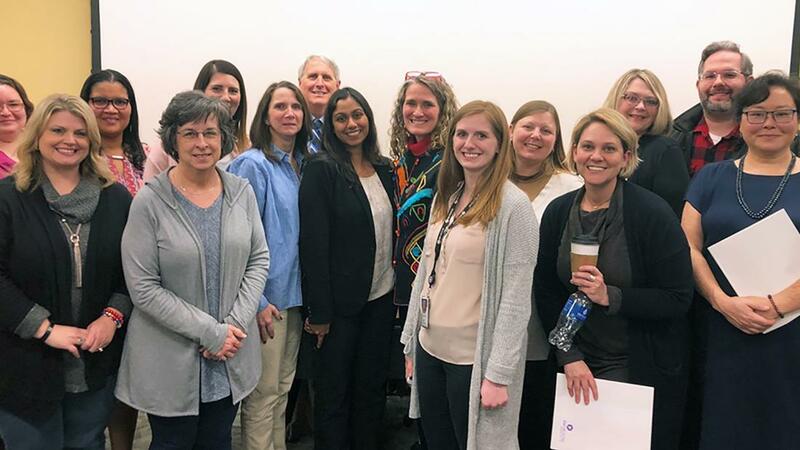 SIU School of Medicine and the National Association of Social Workers (NASW) Illinois Chapter hosted a conference on March 14 as part of National Social Work Month. Participants received training and tips during the day-long conference at the Memorial Center for Learning and Innovation in Springfield. NASW Illinois Chapter West Central District Chair Laura Hepp Kessel and Executive Director Joel Rubin welcomed guests from around the state before introducing Greg Jensen, administrative director of the SIU School of Medicine Neuroscience Institute. Jensen trained the attendees on Ethics and Risk Management. Social workers are required to receive three hours of ethics training annually. “Health professionals confront ethical dilemmas daily,” said Jensen. His training spotlighted the highest risk areas of social work practice and showed how to proactively manage the inherent risks. Lakesha Butler, PharmD, clinical professor in the Department of Pharmacy Practice at SIU Edwardsville, encouraged attendees to strive for cultural competence and professionalism in their practices. She emphasized the importance of appreciation of various cultures and diversity for all social workers. The conference highlighted the important role social workers play by helping individuals and communities build on their strengths. The day concluded with a Cultural Competency and Awareness Roundtable featuring Wendi Wills El-Amin, MD; Vidhya Prakash, MD; Christine Todd, MD; and Kari Wolf, MD, all with the SIU School of Medicine.